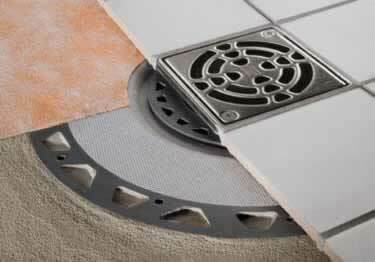 Schluter®-KERDI-Shower Tray ST is a lightweight, expanded polystyrene, sloped shower tray designed for use in mortar-free applications. Engineered to reduce weight and installation time. Designed to integrate with KERDI-SHOWER-SC and KERDI-BOARD-SC shower curbs, KERDI waterproofing membrane, and KERDI-DRAIN. Sizes with Center Drain: 38" x 38", 48" x 48", 72" x 72" 48" x 72", 32" x 60"
Size with Off-Center Drain: 32" x 60"
Koffler also sells Schluter KERDI-SHOWER-SC and KERDI-BOARD-SC shower curbs, KERDI waterproofing membrane, and KERDI-DRAIN. Designed to integrate with KERDI-SHOWER-SC and KERDI-BOARD-SC shower curbs, KERDI waterproofing membrane, and KERDI-DRAIN. Schluter®-KERDI-Shower Tray ST is a lightweight, expanded polystyrene, sloped shower tray designed for use in mortar-free applications. Engineered to reduce weight and installation time. Stain and chemical resistant - great for walls, floors and countertops. Available in 40 standard MAPEI® colors.